Although slowed by rain showers Monday, construction preparations are well underway for the new wing at Good Samaritan Society – Albion Wolf Memorial Home. 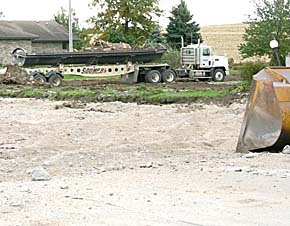 Official groundbreaking and donor celebration will be held Thursday, Nov. 3, starting at 3 p.m.
A tree line at the south edge of the property, as well as a portion of the east parking lot, were removed last week by Bygland Dirt Contracting to make room for the new construction. The tree line was removed to accommodate a south driveway, which will allow fire department and utility access to the nursing home. The general contractor, Brester Construction of Lincoln, was on site Monday to prepare for pouring footings.